In the prologue of We Are Water (HarperCollins), Wally Lamb’s heavily plotted new novel, a museum curator describes the work of a fictional painter, Josephus Jones, who he believes is on par with “Jacob Lawrence and Horace Pippin, and the breakthrough artists of the Harlem Renaissance.” The curator notes that while Jones lacked technical expertise–he knew nothing about chiaroscuro, proportion and perspective–his talent for color and intuitive sense of narrative more than compensated for his lack of formal training. I thought of this description a great deal while reading Lamb’s book. While the novel could hardly be described as lacking technique, what stands out is Lamb’s narrative, or more precisely, his multiple narratives that include a flood, a murder, the massacre at Fort Hood, addiction, sexual abuse, and a number of other topics. We Are Water is told in multiple first person viewpoints. At the beginning of the novel Lamb alternates between Anna and Orion’s voices, but as the novel progresses we hear stories from other characters, including Andrew, Merissa and Ariane. This technique works, and may explain why although we don’t often get to the specific core of a character’s emotional life, we feel close to them anyway: they are speaking to us directly. All of which is to say that despite my reservations, I found We Are Water hard to put down. Lamb often leaves his characters on a limb right before changing perspectives, and so we want to read further because of the most basic–and essential–reasons: we need to know what happens next. Lamb is no great stylist, but he does tell a good story, which, in the end, is enough to recommend the book. 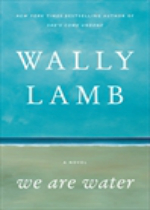 Lamb sheds little new light on the many issues that confront his cast of characters, despite the novel’s length (over 550 pages). But his understanding of narrative mostly compensates for what feels like an aerial view of the complexities of modern life. As a page-turner, We Are Water is this winter’s summer read.